A bad logo can hurt your business growth. There is nothing worse than seeing a new business go into operation with a terrible logo. There are sites dedicated to ridiculing these companies who operate with a logo that doesn’t reflect who they truly are. I feel sorry for them because I honestly believe that they have no idea that a bad logo can hurt their business growth. I want to stop the madness. As a business owner you need to take your image seriously. You are obligated to throw your personal bias aside and take a REALLY close look at your target audience when you decide to have a logo designed for your company. This decision and the outcome is not about you or the designer who created your logo. It’s about the people you serve. You need to understand that your logo is your first point of contact for any new customer. In that split second they see your logo they are judging you. They are determining your quality, customer service, pricing and more. All in a split second. Humans are visual creatures. Aesthetically pleasing visuals are what we enjoy and connect with. When you introduce your company to the world by showcasing a clip art concoction that gives your company the perception of being a discount bottom feeder with crappy service. You are hurting your future and sales growth. What makes a terrible logo. Design is not subjective. Design is visual problem solving. Each solution has a set of problems that need to be addressed. First, who is your target audience? If you are trying to capture millennials, you better be up to speed on current design trends. Sporting a logo with drop shadows and photoshop filters is not going to cut it. Your logo also needs a story. If you want to attract the right customers and employees, your logo should visually showcase who you are and why you do it. It should tell your brand story. People love hearing stories. Stories connect on a deeper level, they are memorable and leaving a lasting impact. Slapping together a bunch of pictures ‘just because’ is not helping you. Need some proof? Here’s an example of what I am talking about. Imagine for a moment. This company is a cutting edge bookkeeping service provider that leads the industry in their quality of work. Accountants praise them. This company wants to attract millennials and new business owners. They are not cheap and their customer service is second-to-none. When you look at this logo what do you feel? Do you scoff at their description? Does the “wants to attract millennials” confuse you? Do you take this company seriously? Does this logo showcase cutting edge bookkeeping? Does it scream to millennials “pick us we are the best!”? This logo has failed to communicate to their target audience. The imagery is barely noticeable. The colours and text are outdated. The design is archaic. The 4 squares mean nothing. When this logo reduces, you lose all readability in the boxes. It might as well not been used. Don’t even think about getting this logo embroidered on a shirt. It is ineffective, not versatile and lacks any memorable appeal whatsoever. Gut check time. Now look around you. Look at YOUR logo. Are you making the same mistakes as this company? If you are, you need to seriously consider redesigning your logo. Be proud of your logo. Your logo should be a crown jewel of your company! It should be something that your customers and employees are proud to showcase. When people are introduced to your logo, they should be saying “That’s cool” or they should be thinking “this company is exactly what I am looking for” or better yet they should be saying to themselves “their pricing is justifiable, they look like they know what they are doing”. Now let’s flip the script. This bookkeeping business has the same cutting edge service that leads the industry in their quality of work. Accountants also praise them. This company also wants to attract millennials and new business owners. Their customer service is not cheap and is also second-to-none. What do you think when you see this logo? Your judgements are different aren’t they? Your mood towards this logo is not similar to the one before. I would say that your perception of this company is more positive. Guess what? This is the same company with a new brand and identity. I went into a meeting with the owner of On-Core and explained to her why her existing logo was not going to work. Like any prideful owner, she was reluctant at first to understand my argument even though her business model had changed from what it was 10 years ago. The investment required to make the change scared her as well but over time, she came around. I absolutely understand where she and business owners like yourself are coming from. Your existing logo may have special meaning to you. The very thought of change scares the crap out of you because the future looks uncertain. You are suppose to be in control because you are the owner. The lack of control is uncomfortable. Add in the investment required to make a change…it’s terrifying. But when your logo is designed properly and executed correctly through your marketing plan, it can create continued success. I just wanted to drop a quick note to say “Thank You” for the work that you did for us recently on our new logo and our branding. Let me first say that I hated my new logo, but that is a good thing and let me explain. This process that we went through with Wake Creative, which started as a website design, was so important, and I underestimated how impactful it was. I knew that the look and feel of my company was important, but your process of exploration before doing any work made me stop and think about why I was in business and who I wanted to appeal to. It made me realize that my current logo was designed for myself, someone who thinks in square boxes and likes things in balance. Yet my target market was for people that didn’t think this way. They need a visual of someone trusting, up to date with today’s trends and not ‘old and stogy’. My existing logo simply did not appeal to my target market. The Brand Bible further helped me define who I was and what I wanted. Nice touch to the branding and the incredibly thorough job. When we first launched my logo and branding I hated it. But my customers loved it. I have to admit that I get more comments on my logo now than I ever have in the past. Better than that, my phone is ringing off the hook with new potential customers and the market that I wanted to reach is now calling me. I really believe that branding myself properly had a lot to do with the phone ringing. Thank you for having patience. I know that I can be a hard person to sway, but you succesfully managed to do it. By the way...I now love my logo and it looks pretty damn good on my wall. Your logo does not have to be terrible! Remember your logo is not about you or the designer who is creating it. It’s about solving a problem for your business. Your logo doesn’t have to be terrible. The process of having one created doesn’t have to be a nightmare. It should be an amazing experience! Similar to you getting a personal makeover with a new wardrobe included. Your new logo should feel good and make you proud to be it’s owner. But most importantly it should increase your business and increase your perception to your target audience. 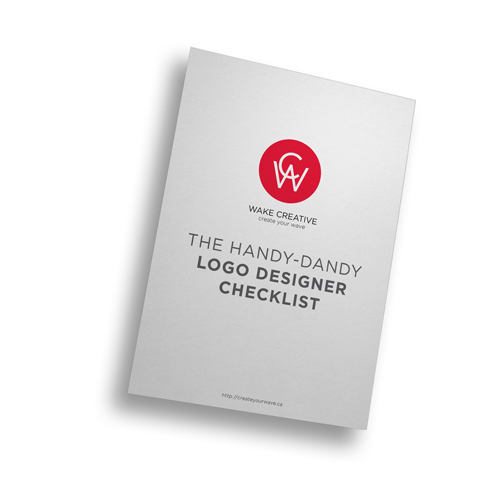 If you are ever at a crossroads and need help finding the right logo designer to tackle your visual problem, I have a handy logo designer checklist available for you. It will help you find the right person to solve your visual problem. It will help you save time and money. Most of all it will keep your stress level to a minimum. It will help you find the right person for the job. Type in your details and I will mail this checklist to you along with my Branding Basics Book. Take advantage of this free offer. No one in the industry is doing what we are doing - empowering you to make the right decision before you invest in your brand. We will email you this handy-dandy checklist How-To Hire the RIGHT Logo Designer when you sign up for our weekly newsletter.